Lattuada’s Mafioso dealt with a Sicilian who works in an automobile factory in Milan. 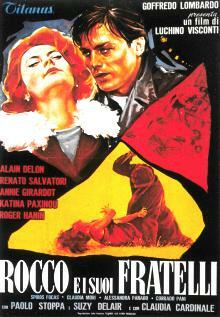 Visconti’s Rocco and His Brothers also has to do with Southern Italians making their way in the North. Criminal behavior is prominent in both films and of course The Godfather deals with the immigration of Sicilians to America through the lens of organized crime. You’re always meeting Romans who have lived in America. Some have even grown up in the States and returned to Rome. Conversely Rome is filled with expatriate Americans who have picked up stakes and sought to reinvent themselves in the Eternal City. Like their Roman counterparts some stay for good and become Italians and some return home to take up where they have left off. For many Americans the return is not so much an act of surrender as a resumption of an important part of identity especially if they’ve become parents. It’s fun to expropriate a culture’s exotic ways and learning to speak another language idiomatically can be a little like donning a costume on Halloween. However, in the case of the Romans you meet in New York, there’s a qualitative difference. It’s rare that you meet a Roman or Italian, for that matter, who wants to adopt the accent of a New Yorker. Many Italians you meet tenaciously hold onto a Italianate persona, even when they’ve found a place for themselves in American society. They may settle down and only return to Rome once a year to see family and friends on the Christmas Holiday, but they're first and foremost Romans. When in New York, do like the Romans is their motto.